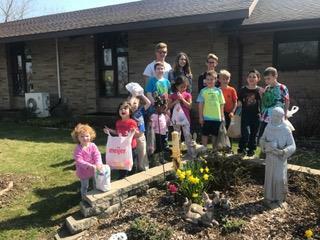 During the Palm Sunday service, Deacon Brad Allard blessed Easter baskets collected for children at the women’s crisis shelter. 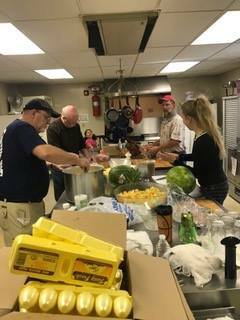 On Holy Saturday, volunteers made preparations for the Easter Sunday breakfast. 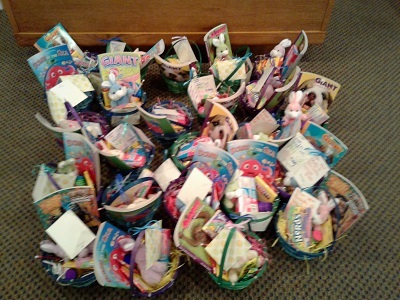 Simultaneously, additional volunteers led children through Easter egg coloring indoors and an Easter egg hunt outside. After the hunt, several children played on the activity set. 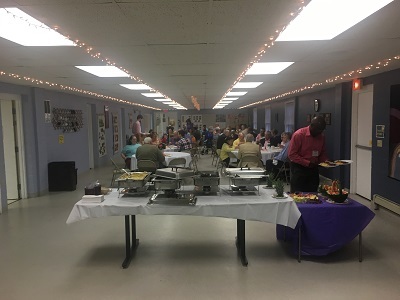 On Easter Sunday, the entire congregation was treated to omelets made to order. Volunteers visited each table, took orders, and then delivered the omelets to the tables. Our Lord has risen! Now let us celebrate through Pentecost. Alleluia! Before receiving Holy Eucharist, we Christians are required to examine our lives, repent of our sins, and be in love and charity with all people. 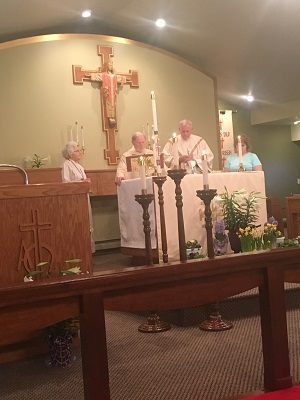 As the Episcopal Branch of the Jesus Movement, the Episcopal Church believes that Jesus Christ commanded all Christians to observe Holy Eucharist. Holy Eucharist is the sacrament designed to help us remember the life, death, and resurrection of Jesus Christ, and to do this continually until He returns. 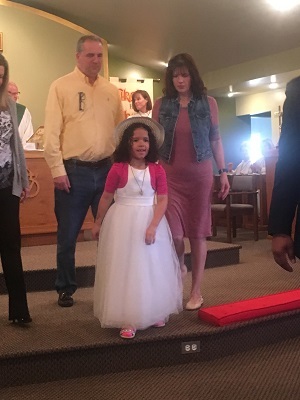 During Sunday service on February 19, we were blessed to witness Madison Gradnigo receive her First Holy Communion (Holy Eucharist). The Rev. Canon Bill Spaid presented Madison with the Body of Christ, and Beth Smith presented her with the Blood of Christ. Madison was joined by her parents, Allen and Jennifer Gradnigo, and her uncle and aunt, Andy and Kelee White. 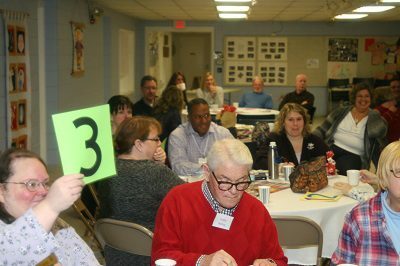 Bread baked by members of Holy Trinity Episcopal Church and blessed by clergy serves as the outward and visible sign of the Body of Christ. Blessed wine serves as the outward and visible sign of the Blood of Christ. 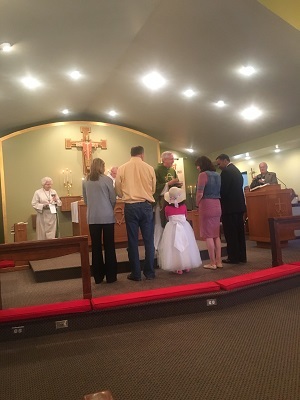 As a community of believers, Episcopalians believe we receive forgiveness of our sins, a strengthening of our union with Jesus Christ and with one another, and a glimpse of what the banquet will be like in Heaven each time we receive Holy Eucharist. However, there is always room for more at God’s table, and WE INVITE YOU to join us at our earthly banquet table each Sunday morning. 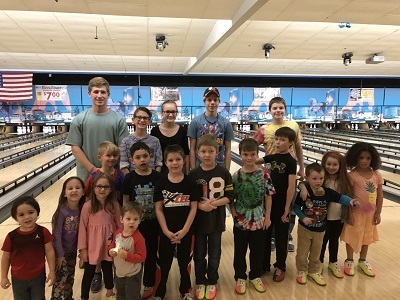 K evin Wells and his committee organized and successfully executed Holy Trinity’s 2017 Mid Winter Bowling Blast on Saturday, February 11. This annual event is designed to be a recreational option for supporting the Family Network of Wyoming, and support them, we did. During our Bowling Blast and later during our Pizza Blast, we were able to collectively gather 100 pounds of food donations. We had a total of 18 Episcopal youth, 30 adults, and another handful of spectators join us for bowling at Spectrum Lanes. In addition to equalizing activities such as bowling between the legs and bowling with our non-dominant hand, we had some 50/50 drawings to spice up the fun. Our champions this year called themselves “The Pin Killers” and were comprised of Brady Atwell, Lily Bloye, Rob Atwell, and Ron Newman.